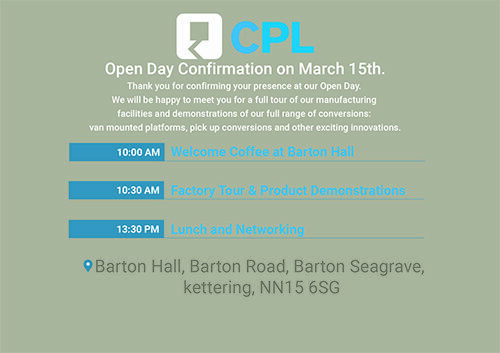 CPL are opening the doors for our first open day of 2019 to demonstrate some of the innovations we have to offer. On Friday 15th March 2019 we invite you to come to the CPL headquarters in Kettering to see our conversions in action. We will kick things off at 10am at Barton Hall for a welcome coffee. From here we will continue with a tour of our three manufacturing facilities where you can see exactly how we manufacture your fleet of access platforms from start to finish. We will carry out demonstrations of our great range of conversions and to finish things off we will stop for lunch where you can network with similar companies and speak with the CPL team. If you would like to stay in a nearby hotel for the evening, please let us know and we will arrange this. There will be a variety of conversions at the open day including our market leading P130A Pick up Access Platform. The CPL Chipper Tipper, A variety of the Klubb Van Mounted Access Platforms and some of the Fully Electric units we can offer. If you would like to come in and see how CPL has become the leading access platform specialist in the UK, Contact us now for your place.